Two days ago, Xiaomi Vice President Hugo Barra had quit saying he wanted to return to his roots in Silicon Valley. Turns out he had a definite company in Silicon Valley in mind. Barra has joined Facebook, founder Mark Zuckerberg announced today. At Facebook, he will lead Facebook’s Virtual Reality efforts, including its Oculus team. 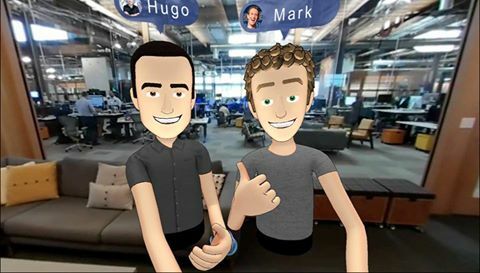 For good measure, Zuckerberg shared a picture with Barra in VR while he is still is in China. “I’ve known Hugo for a long time, starting when he helped develop the Android operating system, to the last few years he’s worked at Xiaomi in Beijing bringing innovative devices to millions of people,” wrote Zuckerberg. At Xiaomi, Barra had led its expansion into India, and helped turn it into one of the most valuable startups in the world. Xiaomi was last valued at $45 billion, but reports had speculated that its value had dramatically slipped in recent months. Before joining Xiaomi, Barra had been one of the stars of Google’s Android division, and had been among the most recognizable faces in the Android ecosystem. Even at Xiamoi he had become the face of the brand, launching products with elan, and often going the extra mile – once doing a planking challenge – to promote its products. Facebook’s VR is one of its most public-facing initiatives. At the last Oculus event, founder Zuckerberg had regaled his audience with an extended performance while being entirely in VR. Barra, with his easy presentation style and well known public persona, will be a natural fit for the role. It helps that Barra seems to as enthused about VR as Zuckerberg clearly is. “Hugo shares my belief that virtual and augmented reality will be the next major computing platform. They’ll enable us to experience completely new things and be more creative than ever before. Hugo is going to help build that future, and I’m looking forward to having him on our team,” said Zuckerberg.